On March 17, 2010 the HIT Policy Committee met. There were reports from the Strategic Plan Workgroup, which outlined its vision of a “learning health system,” where patients, providers, government and technology will work together to generate knowledge to improve quality and clinical outcomes. The Certification/Adoption Workgroup reported on its patient safety focused meeting. And the NHIN Workgroup reported on its work and gave an update on the NHIN Direct project. There was also an update from the HIT Standards Committee and a report on the Certification NPRM. Tony Trenkle from CMS gave remarks on the over 200 NPRM comments received (of which 1/2 have been already read) and the process going forward (see analysis on Health System CIO Blog), while Jessica Kahn, also from CMS, discussed the Clinical Laboratory Improvement Amendments(CLIA). Certification was a very important topic of the meeting. 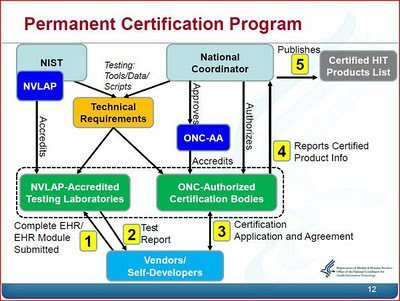 The NPRM proposing the establishment of certification programs for purposes of testing and certifying health information technology was issued earlier this month with a request for comments. The NPRM proposes a temporary certification program to assure the availability of Certified EHR Technology prior to the date on which health care providers seeking the incentive payments would begin to report demonstrable meaningful use of Certified EHR Technology. A permanent certification program will ultimately replace the temporary certification program.